Want to escape Houston’s traffic, but maintain the convenience of an easy commute? 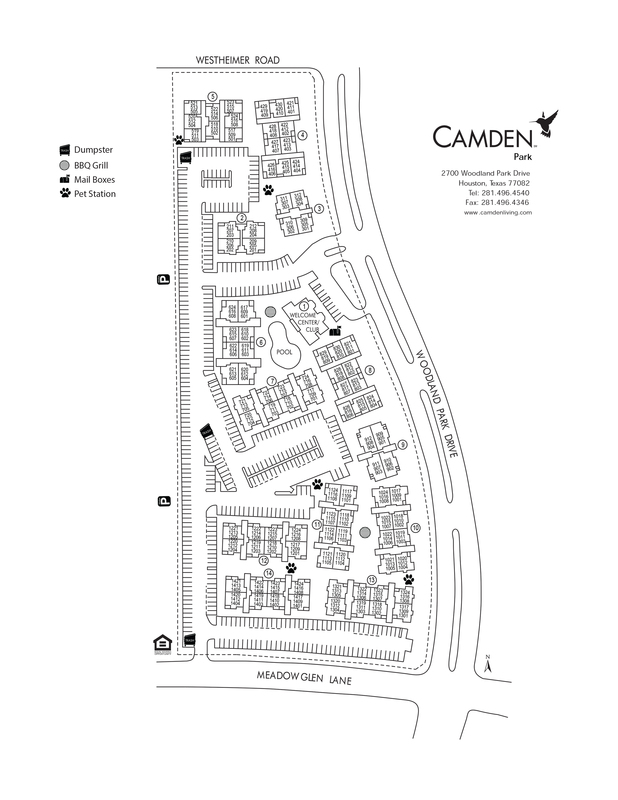 Come home to Camden Park apartments, conveniently located in the Houston Westchase District. Choose from spacious one, two and three bedroom apartments without sacrificing the lifestyle you want. Direct access to Westheimer Road provides residents with a variety of shopping and dining options, a healthy lifestyle next to Terry Hershey Park, and the convenience of being located near the Energy Corridor. Love to cook? Be sure to check out the Westchase District Farmer’s Market every Thursday, or enjoy the nearby Whole Foods, Trader Joe’s and Sprouts! Be every coworker’s envy with convenient access to the Beltway 8, Westpark Tollway, Westheimer, US-59 and I-10 – and shave some extra time off of your commute! The luxury amenities are here for you to enjoy with your friends and family! Take a dip in the gorgeous resort-style pool or get some exercise in the 24-hour fitness center complete with cardio and free weights. The sundeck and outdoor grills with picnic areas offer a peaceful entertainment retreat on a beautiful day, and the business center with nearby coffee bar are perfect for when you need to get some work done or an extra caffeine boost. Each pet-friendly apartment home has been newly remodeled with stainless steel appliances, espresso cabinetry, framed mirrors, nickel finishes and two-tone paint with wood-style flooring. Other conveniences include full-size washer and dryers, large walk-in closets and garden tubs. You’ll love the open-concept floorplans with plenty of space to entertain and relax. Residents receive a technology package included in their total monthly rent with a savings of up to 48% off retail. This money-saving package includes high-speed internet up to 150 Mbps and over 140 digital video channels through Xfinity. You can even use the Xfinity Go app on your smartphone or tablet to access your digital video anywhere! No matter where you’re from, come home to Camden Park. You deserve it! View our available apartments here. Interested in Houston's best 55+ apartment community located just minutes from Camden Park? Check out our sister community, Camden Royal Oaks! Reserved carports are available to rent for $35 per month.